With Andrew Graham’s promotion from the Connecticut Tigers to the Whitecaps, the Detroit organization had another spot to fill. The Tigers filled that spot with another former catcher who played in West Michigan, with Mike Rabelo. He spent 2011 as hitting coach for the Gulf Coast League Tigers, and 2012-13 in the same position for Connecticut. Rabelo was drafted by Detroit in 2001, spending the 2006-07 seasons with the big club. He started out his minor league career with the Oneonta Tigers of the New York-Penn League in 2001, before they relocated to Connecticut. In the first of two season with the Whitecaps in 2002, he hit .195 with 41 RBI’s. In 2003, Rabelo improved to hit .274 with 40 RBI’s, and 16 doubles. It’s always fun to watch former players move up the ranks in the coaching department, too. Johnson with serve as the teams pitching coach, as he did last season. He spent the 2008-12 seasons as pitching coach for the Whitecaps. Johnson pitched in the majors for nine seasons, including a stint with the Tigers. Scott Dwyer, who was the hitting coach in West Michigan just last season, will take Rabelo’s old job in Connecticut. They seem to have a very good staff lined up for the C-Tigs this season, that the Detroit organization seems to have some confidence in. 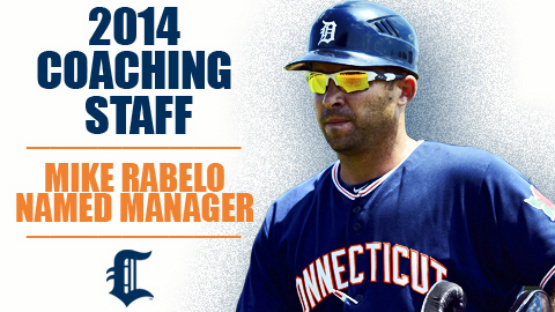 We wish the Connecticut Tigers and Rabelo all the best this coming season. After all, they will be mentoring some future Whitecaps in the coming years for sure.